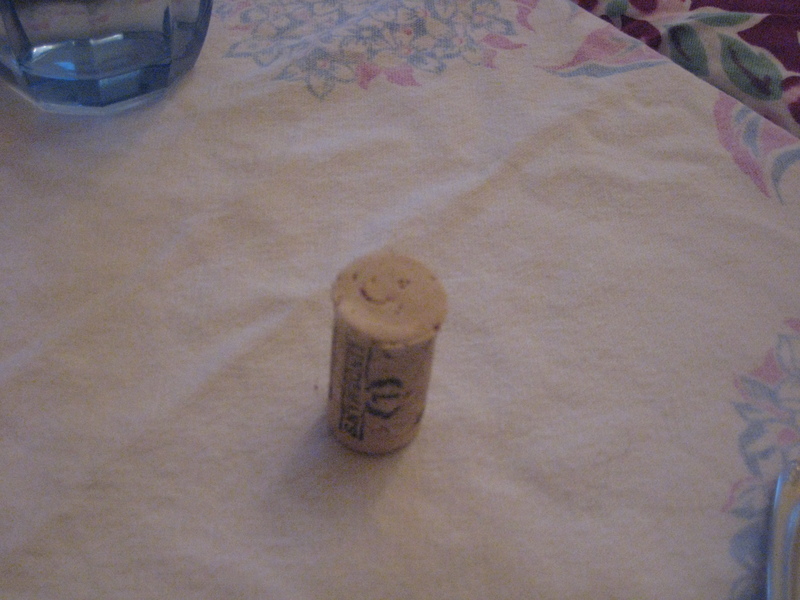 Thanksgiving cork at my table, smiling. Setting up my dining table command center for a morning of work, I look at the CDs to find the day’s soundtrack. Something not too demanding, lyrics are okay for the work I have to do today. I find Iron & Wine, Our Endless Numbered Days. I put it on, but it’s not as simple as I remembered. It propels me back to the early days of Merida, the vague panic I felt when my sleep-deprived mate Robert abandoned me each morning to go off to work. I sat in the rocking chair, nursing the baby to her morning nap, listening to Iron & Wine’s breath, quiet and trapped until she would wake. Sometimes it was an hour, sometimes longer, my infant, my living heart that stepped into the world safe in slumber on the Boppy pillow. Sometimes I waited for my friend Colette and her baby Sabine to come over, so we could strap babies to our bodies and go for a hike, or simply share the overwhelm, the “quite an adjustment” to becoming parents. Or sometimes I read a book, or more likely a magazine, often something about mothering, how to make things perfect, or just how to survive these early, stretchy hours and days. They felt they would last forever. They didn’t. Now it’s now, now she’s off being seven at school with her friends, now I have only a few grains of baby left in the hourglass, which is fine, which is good, which is what I want, which is heartbreaking. Now, at night, she worries about all the people around us who are ill, or have died, recently. We name them, talk about how. I remind her that there are also babies being born, babies we know or will know. “I was just thinking about that!” she says, sounding happy. We name the babies, too. But still, the ghosts. She writes elaborate notes to the ghosts that are haunting our house, folds and paperclips them into tiny swaddled bundles, and tosses them out the window into the snow, where I will leave them until they decompose. She knows that it’s worth writing the notes, that maybe it will help. Which is fine, good, what I want, and heartbreaking. That some day she will read my words. That some day she will understand how complicated it all is, this leading, this being a parent to a person, to an eventual woman. That some day she might also have music that will tunnel her back, how music will do, to a time that seemed it would never end. That everything ends.